A Cure All for an Upset Stomach? …Oh man do I wish something like that existed. The stomach flu is like the worst thing EVER in my mind. I’m am literally terrified of it. I run the other way if someone even THINKS they are coming down with something stomach related. So imagine my horror when I woke up from a sound sleep last weekend and realized I was sick. Now, I’m a mom, so sharing intimate details of illness seems totally normal to me. This is probably not the case for most so I’ll spare you the yucky details. All I’ll say is I had a lower GI thing going on and it was rough! I’m still breastfeeding L so I always have to research what medicine I can and cannot take. According to lactmed.com (which is a great resource for breastfeeding moms!) regular use of Pepto-bismal is not advised. I decided I’d take one dose and see how I felt before doing anything else. Well, that one dose didn’t touch what was wrong with me. I was curled up in the fetal position on the couch while D gave L breakfast when Andrea, from Diva Goes Organic, suggested I try raw, organic apple cider vinegar. 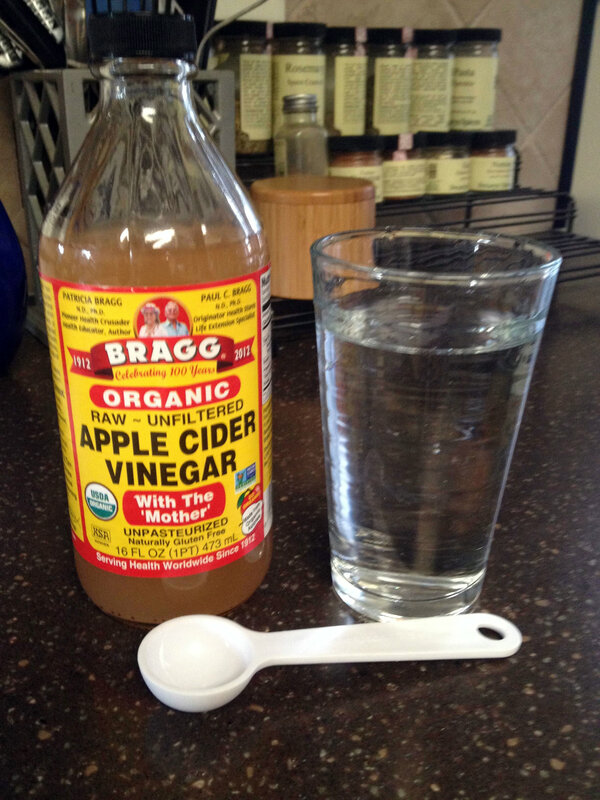 At first I thought she was nuts – I mean, my stomach was already pretty tore up and now I’m supposed to drink vinegar?! I was feeling so sick though that I was willing to blindly try anything, so I got in my car and drove to the store. I brought a glass of water with me so I could mix it with the vinegar and drink it on the way home. Now I’m not going to lie and say that it was the best thing I’ve ever drank, but honestly, it wasn’t that bad at all. The best part, in about 30 minute I was feeling so much better. Full disclosure…I was still sick for a few more days but drinking the vinegar and water mix really helped with the symptoms and made it possible to function. 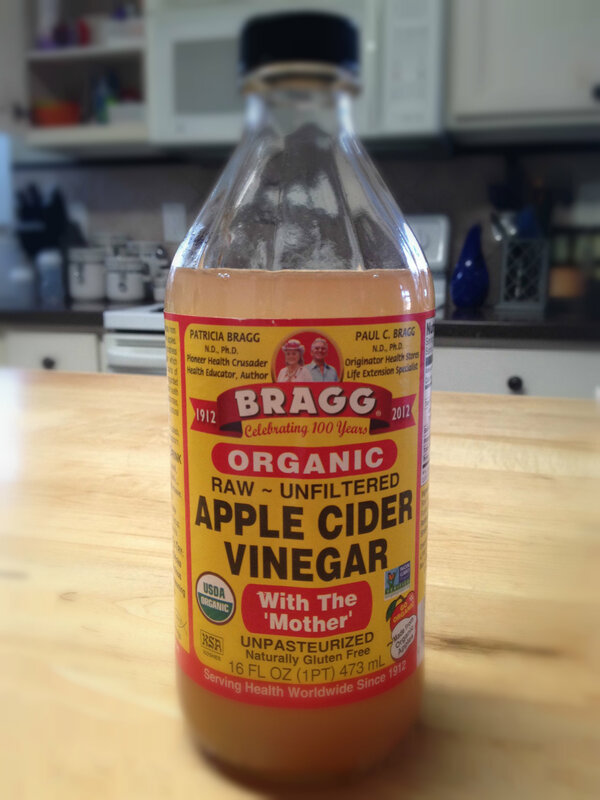 Apparently raw, organic, unfiltered apple cider vinegar (I used the Braggs brand by the way) has a bunch of great uses. After it worked to help make my stomach issues manageable I started researching what else it could be used for. 1. It can help lower glucose levels, making it great for diabetics. 2. Taking 1 TBSP in 8oz of filtered water can help balance the bacteria in your gut. This is what helped “cure” my stomach issues. 3. People also use it as a weight loss tool – it makes you feel fuller longer. This is one that I’m not totally sold on! 4. It’s a natural way to relieve heartburn. I know several people that used it while pregnant since it’s totally natural and safe for baby. 5. It can be used as a natural astringent to clear up a breakout. 6. It can help neutralize a sunburn, either by soaking in a tub with water and vinegar or applying compresses soaked in a mixture of vinegar and water directly to the burns. The more I look into natural remedies the more I like what I find! I will definitely be adding this to my “medicine cabinet” for future use. Do you have any natural remedies you love? Share them in the comments below.